Innocence and the Eye to see it….Equivalents. Assuming Picasso said something of the sort above – it strikes me as one of the key ingredients in finding a way to let go of the filters created in our mind – the learned way that we have of seeing things – which then depending on our awareness – finds its way into the structure of photographs. Rules present an interesting challenge – if you know them, then you can choose to work with-in the structure, or you can choose to deliberately oppose them… or somewhere in between. I’ve been looking at “Mirrors and Windows” by John Szarkowski, where the term “romantic” is suggested to describe a photograph more about the picture maker’s sensibility – and taste – and where “realist” is suggested to describe a photographer whose intention is to describe an “acceptance of the surface appearance of things” – “to describe appearances”. Szarkowski points out that these things are not so readily or nearly so clearly evident – suggesting that these two extremes might be considered extreme edges in a range of possibilities. It is an interesting premise – a way to overlay a level of artistic consciousness onto photography. But as Szarkowski notes – it is just an abstract analytical device. Straight and Synthetic is another dichotomy overlaid upon the way in which photographs are made – more about “process” – the mechanics of recording an image – and interestingly not about subject matter. (happen stance / staged). “Straight” is “as-is” from the machine – “Synthetic” is a photograph manipulated somewhere in the production of the image. The analytical overlays along an axis of “Romantic / Realist” and “Straight / Synthetic” relationships might be useful in terms categorizing – to institutionalize a way of looking at photographs – but it does not go beyond describing characteristics. In thinking about this question, I have to say that “Windows and Mirrors” is about establishing a set of rules that can be applied more or less towards analytical looking at a photograph… In my opinion this is less useful in finding your way towards making a photograph. To me, it is not an “or” proposition – you can’t escape the willfulness of making a photograph – photographs aren’t objective – they are always subjective views of the world. Some decisions are required – at some moment action is taken to press the button or some set of rules are put in motion – at the will of the artist. This is why I say there are no objective photographs – and who cares? In the result, the “window” is produced – it is rendered by the willful action of the artist – and if you choose to look at it – look closely at it – you might see something of the world – if it’s a good photograph, you might see the artist viewpoint of the world. But you’ll never have a truly objective view. I find Minor White’s conception of four kinds of photographs – documentary, pictorial, informational, and the equivalent, – especially the equivalent – as accepting the willfulness inherent in picture making. I think it is the inability to explain in a prescriptive way the characteristics of the equivalent, yet to be able to describe the effects which is important. The equivalent, can’t be explained away – it is that thing about a photograph that captures your attention – for whatever reason and “for unstable reasons becomes decidedly significant to you”. UPDATE (Most) – Fine Art Photography is I would argue, fundamentally romantic (especially that work which is in debt to obscure art historical references (do you get it?)) and a profoundly self-centered endeavor. Rules might give you a way to play the game, but is that where the aesthetic value resides? 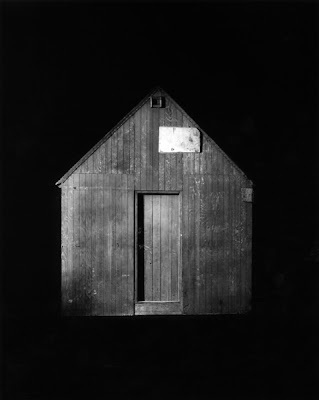 So now I’ve come across the work of Richard Barnes, via Alec Soth’s blog – in particular the “Unabomber” series which causes me to completely rethink the “fundamental” statement above. This comes as a healthly dose of self-realization that generalization and labels are sometimes of little real value – even more so upon trying to grasp more of the rich complexity of Barnes’ work. In a way, I’m glad I was so wrong! This entry was posted in Art Photography, Criticism, Inspiration, Other Artists by Matt Niebuhr - West Branch Studio. Bookmark the permalink.